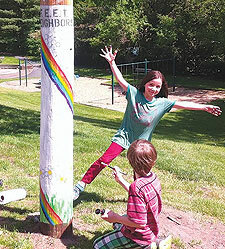 Local artist and neighbor Robyn Flatley, a 1981 graduate of Pacific Northwest College of Art and longstanding member of F.E.E.T., managed the project coordination. "I wanted to do something that celebrated the neighborhood I live in and to create a project that focused on the positive and the beauty in our community," says Robyn. F.E.E.T. is a group of neighbors and people who live and work in the Triangle who have a mission to "Take Small Steps to Build a Greater Community." The group has sponsored other FEET Print projects, including a large mural at the Restless Rooster Café and several gardens that are located at the corners of the Triangle. F.E.E.T. also has a Neighborhood Pride Zone campaign and works to create a "we" attitude in the neighborhood. 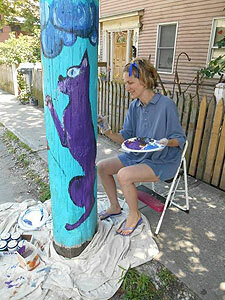 The 15 poles were painted by many neighbors and supporters including Kate Richardson, Paul Rodrigue, Robyn Flatley, Sage Feldman, Crystal Kinney, Kidsplayce director Michelle Mahin, Misty Watson, John Webster, Kris & Stewart McDermet, Don Brown, Jason Hunter, Tom Finnell, Kate Audlin & Chris Blood, among others. Artists were given a few guidelines, but otherwise were free to choose their own designs. Paint was either donated or subsidized by a small community grant from Ben and Jerry's. Free ice cream and other giveaways will be available during Gallery Walk on Friday, September 1, from 5:30 to 7:30. Rain Date: Sunday, September 3, 11:00 to 1:00. For more information about F.E.E.T. 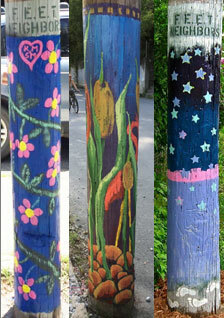 or to get involved in future Pole Painting in the Triangle neighborhood, visit www.facebook.com/groups/FEETBrattleboro or call (802) 275-7232.